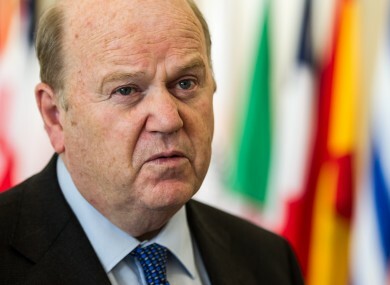 Ireland's Finance Minister Michael Noonan at the Eurogroup meeting in Luxembourg. EUROZONE FINANCE MINISTERS moved closer towards a ‘banking union’, agreeing how the bloc’s rescue fund can provide new capital to failing banks so as limit the damage to the wider economy. “We have made an important step … towards the banking union by agreeing on the main principles for the future rules of direct bank recapitalisation,” German Finance Minister Wolfgang Schaeuble said after talks with his 16 eurozone peers. At the height of the debt crisis, the EU set up the €500 billion European Stability Mechanism to bail out member states. In June, when Spain’s banks looked near to collapse, Brussels extended its scope to allow direct aid for struggling lenders. The problem however was how this was to be done, as Germany among others warned against allowing countries to simply get their banks bailed out at the ESM without strict conditions. Schaeuble made the point again Thursday. Dutch Finance Minister Jeroen Dijsselbloem, who heads the eurozone finance ministers group, said the ESM will be limited to providing €60 billion in all to lenders, relatively small given the size of some recent bank bailouts. The member state involved will also have to ensure that the bank seeking aid has a minimum 4.5 per cent capital buffer and make up the difference if not, and then must make another contribution in due course, Dijsselbloem said. Crucially, bank creditors, including depositors, will be ‘bailed-in’ in any such rescue, to minimise the cost to the taxpayer who has so far funded the debt crisis bailouts. This facility “will help preserve the stability of the euro area,” Dijsselbloem said, stressing how it will get to the crux of the problem by saving the banks without loading additional debt onto strained governments. The ESM bank recapitalisation role is tied to the Single Supervisory Mechanism (SSM) agreed last year which centralises regulatory oversight of the eurozone’s largest lenders under the European Central Bank. Once in place, expected initially in March next year but now likely to be somewhat later, the ESM can begin its recapitalisation work. The SSM, the first step towards banking union, is supposed to be backed up by a Single Resolution Mechanism, which would close down failing banks, and then a deposit guarantee system to reassure nervous investors their money is safe. The 17 eurozone ministers are joined today by their 10 non-euro colleagues to discuss these issues in a Bank Recovery and Resolution Directive, which if approved will then be negotiated further with the European Parliament. Those talks promise to be difficult, diplomatic sources say, with some countries anxious to get a measure of flexibility, especially on the controversial bail-in provisions. A controversial Cyprus rescue in March bailed-in larger savers in its two biggest banks to pay for their restructuring, setting what Disjsselbloem said at the time could be a model for later bailouts. The finance ministers also discussed the increasingly uncertain situation in twice-bailed Greece, amid reports its latest programme is in trouble. Both Dijsselbloem and EU Economic Affairs Commissioner Olli Rehn voiced concern at the latest developments in Athens, with the Greek coalition government at risk after a decision to close the state broadcaster sparked popular outrage. “I appeal to the sense of responsibility of political leaders in Greece for the sake of Greece and of Europe,” Rehn said. Dijsselbloem insisted that the Greek bailout was on course and properly financed, but added that it was urgent that its creditor Troika of the EU, ECB and the International Monetary Fund complete a review report by early July. The ministers also formally endorsed Latvia’s accession to the eurozone as its 18th member from January, in what one EU source described as a “very positive” sign of confidence in its future after so much upheaval. Email “Euro finance ministers agree direct help for banks”. Feedback on “Euro finance ministers agree direct help for banks”.